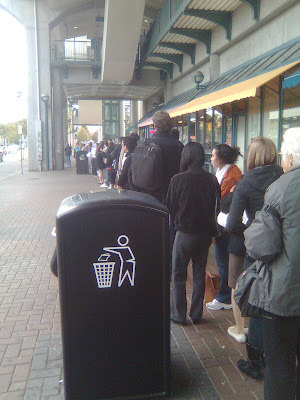 This is a bit of old news that I blogged a month ago, but on April 20th TransLink will be improving bus service. The 502 will be improving from 10 minute peak service to 7 minute peak service. This is much needed as the following picture shows. Also the 502 will now improve from running every hour to every half-hour for Aldergrove service. As it stands now, you have to cross a street whenever you need to transfer buses. If you changed it to the way I propose, you wouldn’t have to cross the street going one direction, but you would have to cross the street twice going the other direction. Basically, you would do this when you know the direction most people went. I wouldn’t do this everywhere, but intersections like 152nd Street and Fraser Highway might be a good candidate for this design. The minute or so saved could be the difference between catching your bus or having to waiting 30 minutes.